During the assembly of the ITER machine, components will be transported from Assembly Hall (foreground) to the Tokamak Pit (background) by overhead crane. The in-pit assembly tool is made up of a central tower and a series of beams. This tool will support the vacuum vessel sub-assemblies and align them while the vacuum vessel is assembled. 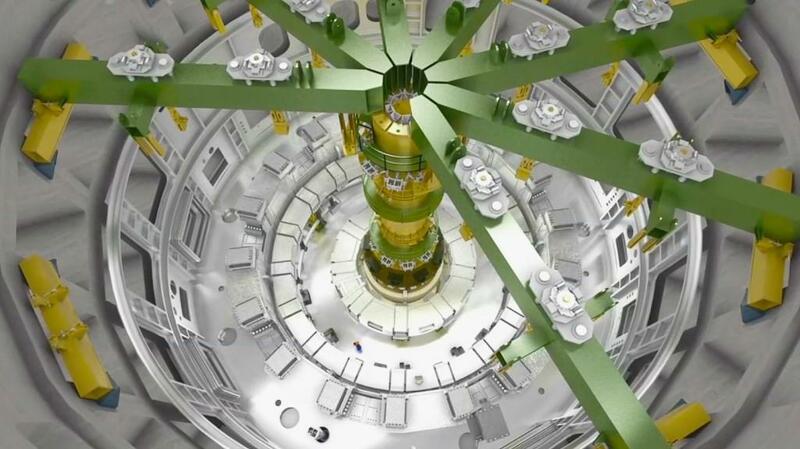 From above, the nine segments of the ITER vacuum vessel—plus their associated thermal shielding and a toroidal field coil on either side—will be lowered into the Tokamak Pit by overhead crane. Working together, the four 375-tonne main hoists in the Assembly Building will handle loads of up to 1,500 tonnes. The ITER "toolkit" for assembly will include very large, heavy, strong, expensive and precise tools. Due to its size and weight, the cryostat will be manufactured in segments and sub-assembled into four sections on the ITER site. During assembly of the ITER vacuum vessel—11 metres tall with an interior diameter of 6 metres—temporary floors, ladders and bridges will be set into place for the teams. 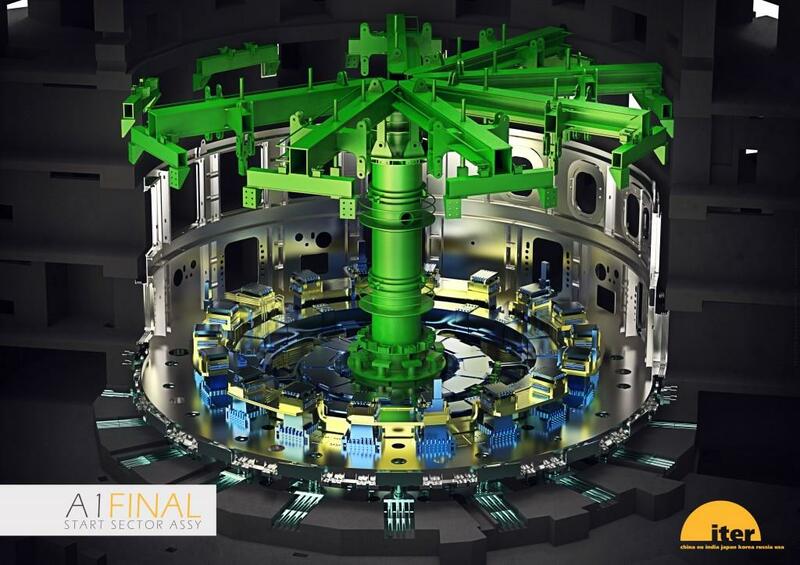 The ITER Tokamak is a one-of-a-kind device and one of the most complicated machines ever engineered. The ITER Organization has overall responsibility for the successful integration and assembly of components delivered to the ITER site by the seven ITER Members. This includes the assembly of the ITER Tokamak, with its estimated one million components, and the parallel installation and integration of plant systems such as radio frequency heating, fuel cycle, cooling water and high voltage electrical systems. 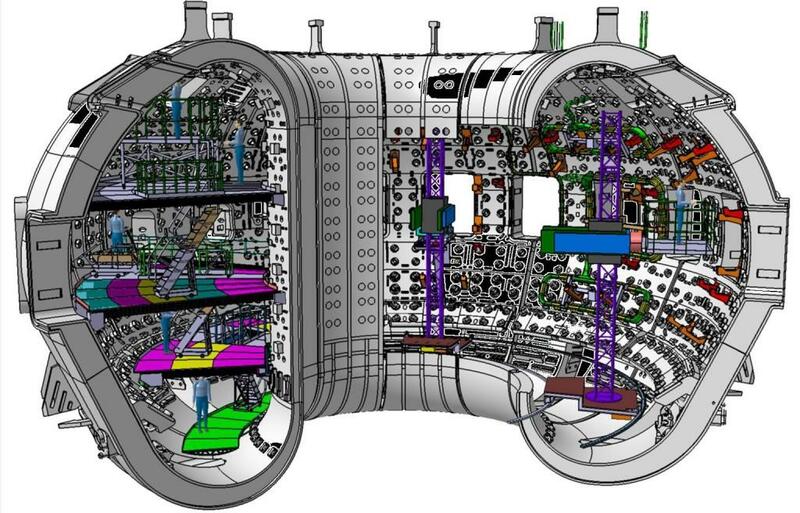 Components provided by the ITER Members as in-kind contributions will be assembled on site in pre-determined sequences. The first manufactured components will be delivered to the ITER site in 2014—from that moment until commissioning of the ITER Tokamak the order and timeline for assembly events has been carefully planned in an assembly schedule that contains tens of thousands of lines for machine assembly alone. Assembly operations will require 1.5 million man hours extending over a period of four years (see related article). In 2016, the ITER Organization selected a Construction Management-as-Agent (CMA) contractor. For ten years (with the option for a three-year extension) the CMA contractor will work as part of the ITER Organization construction team to plan, manage and supervise the works of the assembly phase, including the assembly of the Tokamak and parallel installation and integration of the supporting plant systems. The actual work of the assembly phase will be carried out by ITER Organization contractors (for the assembly of the Tokamak machine and the mechanical and electrical installation of the plant systems) and Domestic Agency contractors (for some plant installation works). Thirty metres in diameter and nearly as many in height, the ITER Tokamak will house a large number of sub-systems and components. The size and weight of the major components, the tiny tolerances and careful handling required for the assembly of huge and unique systems, the diversity of manufacturers, the tight schedule ... all of these elements combine to make ITER an engineering and logistics challenge of enormous proportions. "Clean areas" for machine assembly are controlled to maintain air at a uniform temperature of 20°C (winter) to 25°C (summer) +/- 2°C and relative humidity <70%. A dedicated HVAC (heating, ventilation and air conditioning) system and anti-dust coating on the floor of the Tokamak Building will contribute to maintaining the air quality required by the assembly operations for the ITER vacuum components. The principal assembly activities will be performed in the Tokamak Building, where the ITER device will be installed inside of a partially embedded, concrete bioshield. 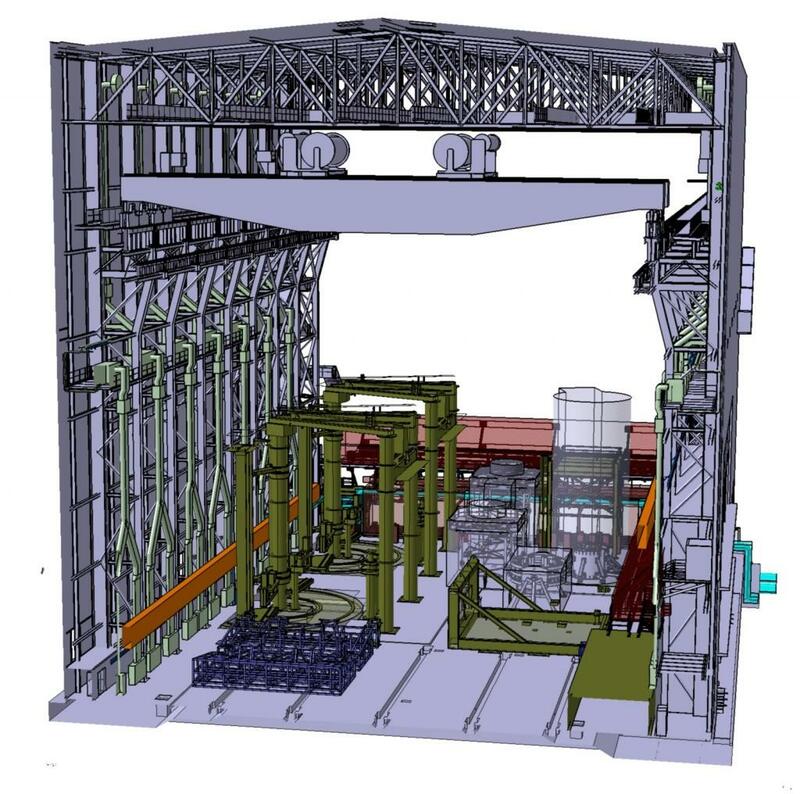 For the duration of assembly activities, the Tokamak Building will be operated as a "clean area" (see box) and maintained at a constant temperature to avoid dimensional changes in the largest components. Pre-assembly activities will take place in the adjacent Assembly Building. Assembly of the ITER Tokamak will proceed in a "bottom-up" fashion. (See ITER Assembly Part I: The world's largest puzzle at left.) 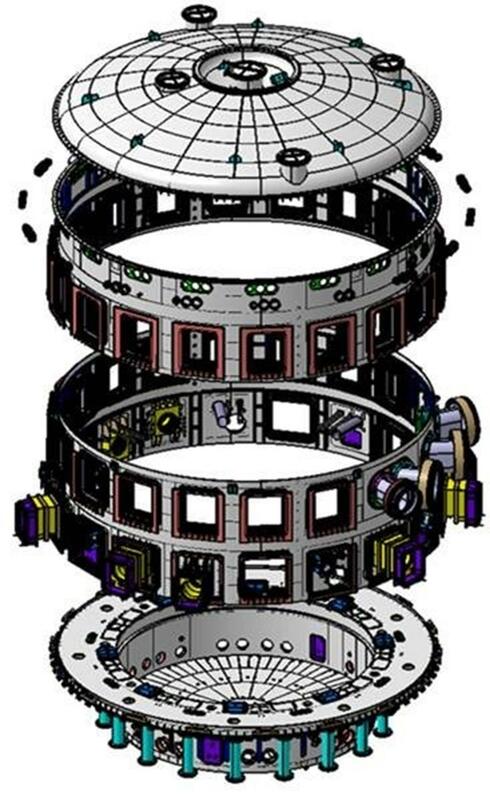 Beginning with the base section of the cryostat—the single largest and heaviest component of the ITER machine—assembly operations will continue with the lower cryostat components, the nine large, 40° sub-assembled sectors (made up of a vacuum vessel sector, surrounding thermal shields, and two toroidal field coils), and finally the components at the top of the machine. Accurate alignment of tokamak components, particularly of the magnet system and in-vessel components, is essential to the successful operation of the machine. (See ITER Assembly Part II: In-Vessel Components at left.) 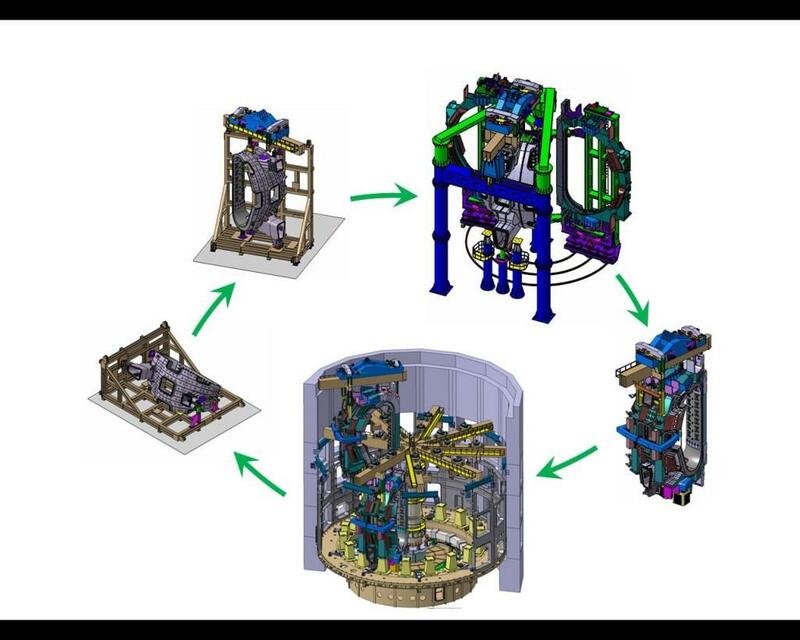 Assembly sequences have been planned with this in mind, and will utilize sophisticated optical metrology techniques at each step of the assembly process. Dimensional control will be critical to ensuring that tolerances are adhered, and to recording the "as-built" status of the machine, which will be directly compared against ITER's Computer-Aided-Design (CAD) models in order to correct eventual deviations in alignment before they accumulate. See the Milestones page for a series of incremental assembly milestones on the way to First Plasma. Component logistics | Consistency "from the cradle to the grave"